For our first starter we had the seared Gressingham duck breast with a spiced leg and mappas roll and served with sesame peanut crumble. This was gorgeous. 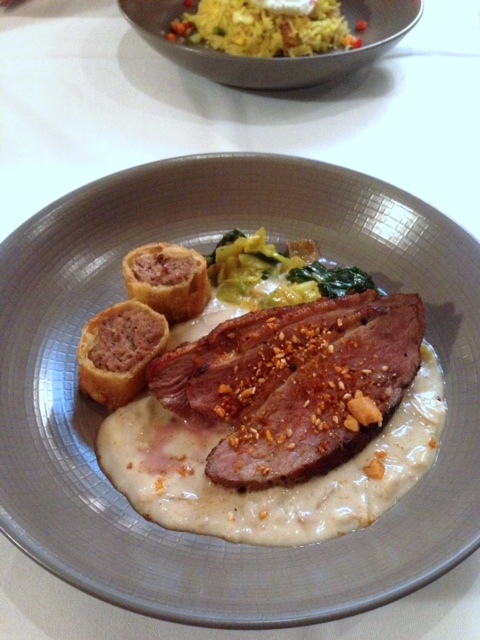 The duck breast was divinely tender and the duck leg roll was wonderfully spiced. The fragrant nuttiness of the crumble was a perfect addition to the dish. 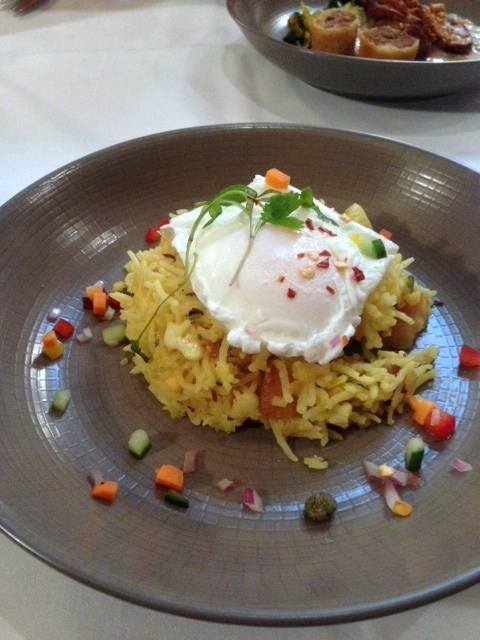 Kedgeree with smoked haddock and poached egg was in contrast a little bland. We couldn’t fault the runniness of the egg and the freshness of the fish. However we would have preferred more spicing and seasoning in the dish itself. To mains and a roast saddle of Romney Marsh lamb with corn sauce, pickled root vegetables, masala and cashew nuts was lovely. 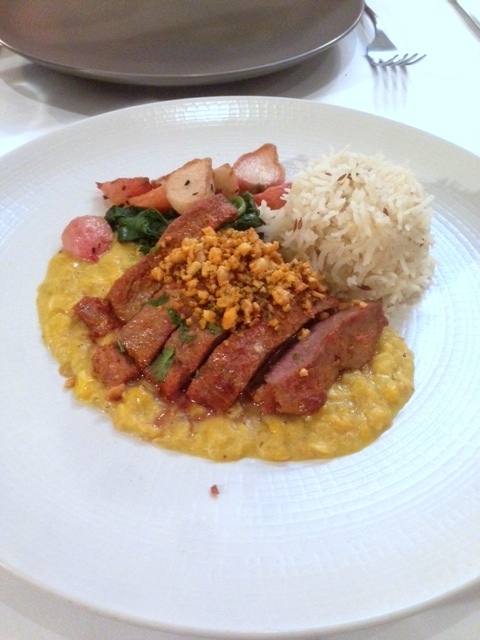 The meat was tender and tasty, and the creamy corn sauce worked well with the lamb. The vegetables had been gently pickled and provided a touch of acidity to the dish. The masala was fragrant and the nuts added a crunchy contrast. 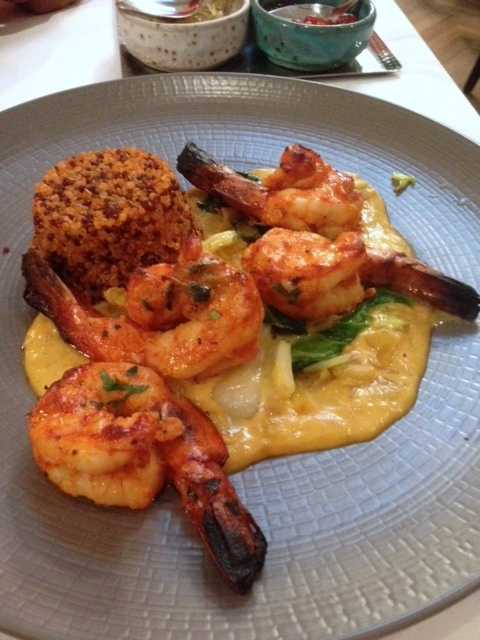 Wild Spencer Gulf king prawns with green mango coconut sauce and red quinoa was wonderful and delicious. The coconut sauce was dreamily good, and provided an explosion of flavours especially when eaten with the red quinoa. The prawns themselves were large and tasty, although I would have preferred prawns with a slightly firmer texture. 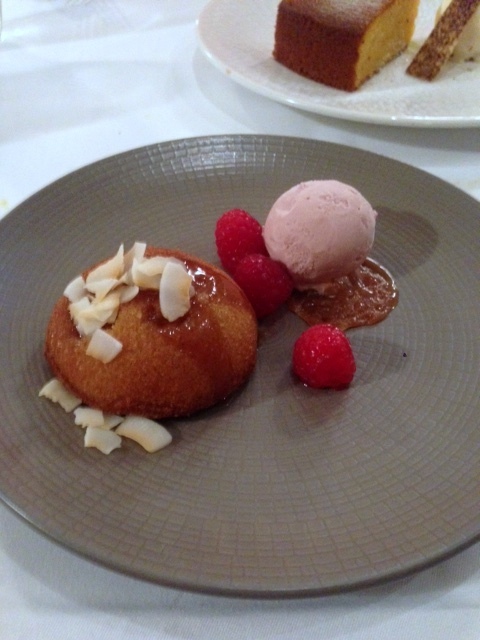 To desserts, and we both loved the spiced almond raspberry pudding with strawberry ice cream. The combination of the flavours was heavenly, with the spices in the pudding contrasting well with the strawberry ice cream. The pudding itself was moist and light, with a nuttiness in its texture. Spiced red pumpkin and corn cake with popcorn ice cream was in contrast, a little less exciting. The cake was moist, but it didn’t quite sing with the flavours that its name was suggesting it had. The Lazy Sunday menu proved to be a delightful dining experience. A few dishes were weaker than others, but on the whole the meal was delicious. It offered lots of wonderful contrasting flavours and textures, as well as being plentiful in choice and reasonably priced. It showcased what a good chef Vivek Singh truly was. The good food, combined with the delightful service and lovely setting completed what was a truly lovely Sunday evening. 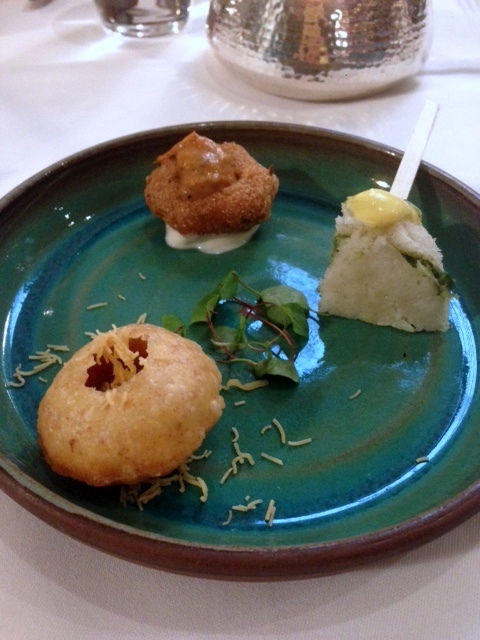 1) The canapes were delightfully good, particularly the steamed rice cake. 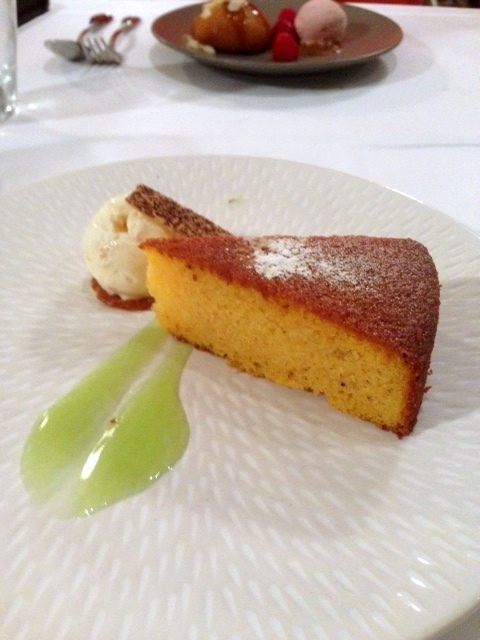 1) The spiced red pumpkin and corn cake, moist but unspectacular. Price: The lazy Sunday menu is £40 a head for three courses. £35 between 5.30 and 6.30. Excludes drinks and service. The a la carte menu is also available on Sundays.